Update: Twitter user @Wario64 spotted a product page on Steam for the Valve Index that cites a June 15, 2019 release date for the headset. According to the information on the product page, the headset uses DisplayPort 1.2 and USB 3.0, and recommends that you use an Nvidia GTX 1070 graphics card or better. A Valve spokesperson has since confirmed the information in an email to The Verge, who said "The tech info on that page, while not comprehensive, is accurate". The information being referred to there is the potential release date for the Valve Knuckle Controllers (now called Valve Index Controllers) and its recommended system specs. The spokesperson said that Valve would target a June release date, with more information to come on May 1, 2019. Unfortunately, there's no listed price yet and, while we can't say for sure, it looks like it won't come with the base stations or controllers inside the box. There had been whispers that Valve was working on its own virtual reality headset, having previously launched VR kit in partnership with HTC, and now those rumors have turned into a real product: the Valve Index. However, the name is just about all we know about the new VR headset for now. 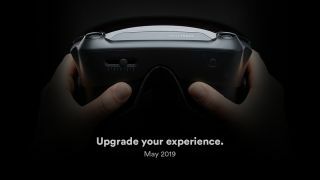 Valve has put up a teaser site inviting you to "upgrade your experience" and listing May 2019 as what we assume is a launch date. We get one pretty good look at the headset, but for now the price and specs aren't clear. At least with Valve's track record it should know what it's doing with the new hardware. Unfortunately there's no sign of the Half-Life game that some insiders were suggesting might be revealed alongside a VR headset from Valve – though maybe Valve is just waiting until May to give us the details. It's certainly a busy time for new VR headset launches, with the Oculus Rift S and the Oculus Quest about to go on sale, and the HTC Vive Focus Plus coming on April 15 as well. There's more choice than ever for discerning consumers but it means the Valve Index is going to be up against some stiff competition when it sees the light of day. Presumably it'll run the same SteamVR game and apps store as the HTC models. What seem to be two sensors can be seen at the side of the Valve Index case and previous reports suggest the headset will come with a wider-than-normal field of view. Expect a lot of these information gaps to get plugged in May. We'll be bringing you all the news of the Valve Index launch when it happens, but in the meantime, you might want to hold off on that VR headset purchase. Oculus Rift S vs Rift vs Quest: which VR headset is right for you?